RE2 remains at the top of my list simply because it's dripping with atmosphere. The art direction is impeccable beginning to end. And the musical score is nothing short of sheer genius. None of the other games can hold a candle in this regard. Interestingly a rumor popped up today via Famitsu and reported online that Capcom is looking at porting, yet again, RE4 and Code Veronica to X360 and PS3. Personally I think they're two of the worse options to do this to, RE4 because it's been on so many platforms already and Code Veronica for being often ranked as the least fav in the series, much like in this thread. I'd rather see something like the Remake ported. If they use the same assets on the disc, then probably. But even RE4 and CV won't hold up to well unless they have the original assets (the CG movies in CV in particular looked fairly bad on the GC port alone, I can't imagine what they'll look like at a 720 or 1080p res). Code Veronica's going to be a control issue nightmare too. 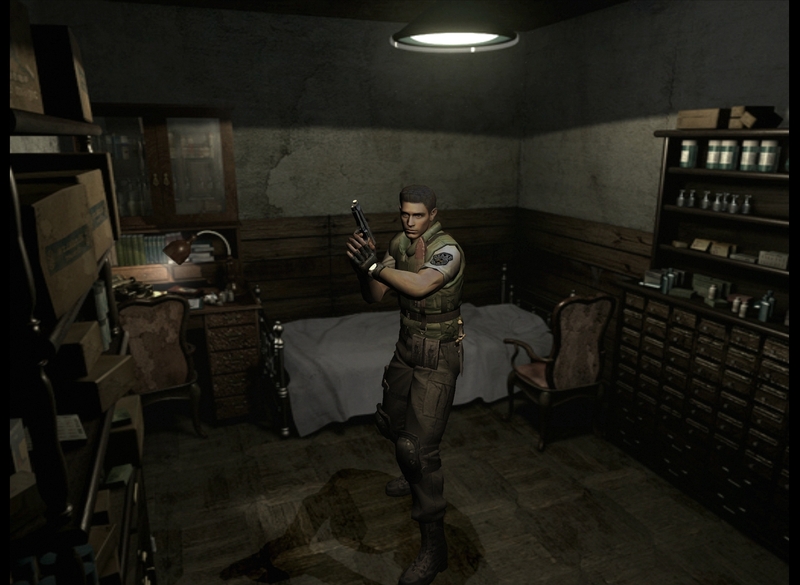 Back when the Remake was coming out they showed some test versions (of what was to be RE4 enviroments in an earlier build) in a higher resolution than the final Remake release so I know the original files were rendered out at a higher res and scaled and compressed for the GameCube. The models running at a higher res in the Remake seem to hold up well in the sub-HD emulators you can get, better than I expect the CV ones will. If RE4 can look like the PC edition with all of the fan-filtering and texture mods on (instead of the crap standard textures it comes with) then it will be fine. Guess we'll see when the scans from the actual issue hit. CV looks unchanged, RE4 has a slightly more detailed texture look but it's not much. Feels more like Capcom keeping fans at bay while they still decide what to do with Bio6 to me. @Rombie What is a "sub-HD emulator?" I'd be curious to check that out. Null on the Google search. I used to like the first and third. But then RE4 was a favourite (I still love the reloading on the first sniper rifle you get). RE5 is good, but it's gone further from the atmosphere and story than RE4 did. And RE4 was pretty distant from the real RE games. Hell, if it wasn't for Leon you couldn't really say it was a RE game. But the game I would happily go back to would have to be the REmake. That was fantastic. I unlocked absolutely everything for that (yes, including the invisible mode, one dangerous zombie and the director's note). I've never done that for a proper RE game before, although I did try that with RE2 and just couldn't get the S rankings I needed. Outbreak just won't get a mention as I really can't be be bothered to play a game where the loading screens are so long and so often. And I've got it installed on a hard drive in the PS2 and it's still too long. @DanBirlew Sorry, I should have said more. It's the Dolphin Gamecube / Wii Emulator. It intended to run games at HD resolutions up to 1080p, but most of the time performance requirements need them to run in just sub-HD editions (like 640p modes) in order for games to work on the majority of computers. It's usually only the Nintendo titles that they seem to get running in 720 or 1080 modes with little issues. Because of it's open source, there are a few user guides and modification you can use to tweak settings. Here is a shot someone else took of the Remake running on it just to show it's not as bad as you'd think upscaled. The website for it is http://www.dolphin-emulator.com/ - files are there for download and there is other screens and video showing off what it can do. Wow, that's pretty awesome. The character model really upholds. I do see that the prerendered background becomes a little pixelated and a little blurry though, and perhaps that's the reason why Capcom isn't porting these up. That and the 4:3 resolution. I remember playing with the REZero's debug functions, making the 3d wireframe visible and moving the prerendered background around, and noticed most were cropped to 4:3. Unless they still have all those environment models and can recapture the backgrounds in 16:9, I doubt it would be a cost effective port. Then again I haven't played the Wii ports. Were they resized to 16:9, or instead zoomed or stretched? I have tried Dolphin recently and no luck. But I do have upscaling equipment and use that to record Wii games in HD resolutions. It reminds me of the PC editions of the original 2 games mostly, which had clean and sharp character and enviroment models and slightly soft/pixely backgrounds. The Wii "ports" of the two were provided into 16:9 from original source files and supported 480p unlike the GC editions, and were also less compressed due to the extra space provided. The CG enviroments created for the Remake and Zero are clearly still in Capcom's accessable library because they were used as real time enviroment models for the Wii's Umbrella Chronicles in a few of the various scenarios covering Zero and Remake areas, so I'm quite surprised that they couldn't do an HD edition of the two games at all. Current rumor has to do with some sort of control/agreement with Nintendo over those two titles stopping them. To this day they're still the only games not to be ported to any rival companies consoles which is surpsing given the number of ports other games in the series have gotten, especially the bigger hits that 2 and 4 both got. Oh yeah, I have the first one of those, Umbrella Chronicles or whatever. I completely forgot about the RE 3D backgrounds in them. But I suppose we have to question whether those were the same environs or recreated. I would assume they were the same, unless some online source tells us so. So in that case maybe they're waiting to do REGC and REZero ports until the gaming sector is absolutely clamoring for them? Or maybe the Wii ports of these games didn't sell as well as they hoped? They're definitely using the 3D models the pre-renders were made from, paintings and objects match in the environments, and they used the same character and enemy models from the Remake/Zero as well. That said UC was mostly done by an outside company hired by Capcom. As for the ports who knows in the end except Capcom I guess. I just expect them to port most games to as many possible platforms in the end, they've done it with others in the series even when they knew they wouldn't sell (like when they ported RE3 to Dreamcast in 2002 when the console had already stopped production). Going back to the actual ports themselves being released - when I was looking at the scans, Code Veronica seems to have benefited from lighting differences over the original but there no change in textures. RE4's texture detail is up, looking more like the Fan modified PC editions. Capcom has since put up some images online which seem to support what I assumed about both from just the scans.